Elizabeth graduated from Northeastern University with her Doctorate in Physical Therapy after receiving her Bachelors degree in Kinesiology from James Madison University. Elizabeth’s clinical experience include several outpatient orthopedic clinics as well as the acute care setting. She has treated patients of all ages with a variety of orthopedic, neuromuscular, and sports-related injuries. Elizabeth is passionate about exercise and enjoys educating patients about the benefits of fitness. 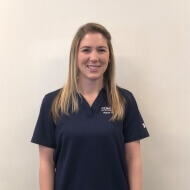 She strives to provide tailored interventions along with manual therapy skills to help patients return to their favorite activities.